Mediterranean sailing holidays in Turkey present a wide selection of breathtaking destinations to choose from. Without having to visit the Aegean region of Turkey, travelers can experience splendid gulet cruises as they explore the stunning coastline. 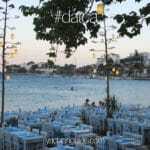 However blue cruises in Turkey are not limited to simply the bays, coves and harbors in Turkish waters. Private gulet charters can easily sail to the Greek Islands such as Rhodes, Crete, Cyprus and all the other smaller islands along the way. Sailing in the Eastern Mediterranean side of Turkey you’ll find more open seas (after the Kekova / Demre region). This area isn’t like the Aegean where there are more frequent clusters of smaller islands. The islands are more spread out, therefore there are longer distances between destinations. For travels such as this, not all gulets are equipped to travel comfortably in open seas. 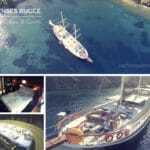 Gulet charters in the deluxe, ultra deluxe and VIP classifications are usually suggested. For instance, island hopping in the Mediterranean can include embarking from the harbor of Marmaris – located on the border between the Aegean and Mediterranean seas. From this point the gulet can cruise to the island of Rhodes, then over to the charming island of Halki then continue to Karpathos island, Kasos island and lastly drop anchor in amazing Crete. Since there are International airports serving both Marmaris and Crete, this itinerary is possible. Travelers might like to spend a full day or overnight so as to visit the ancient sites and explore the shopping and beaches of this impressive island – and then fly home. As an alternative option to combining a blue cruise from Turkey to Greece; travelers may just wish to stay within Turkish waters and cruise from Gocek or Fethiye to the Antalya region, located in the Eastern Mediterranean. Along the way one will find a plethora of historical treasures and sites to discover – maybe with a bit of hiking or biking combined. The whole Gocek, Fethiye and Antalya regions of the Turkish Mediterranean offer an array of architectural ruins, castles and more, to explore. Itineraries such as Gocek – Kekova – Gocek; or Fethiye – Kekova – Kas – Fethiye ; are possible options to consider for routes. Beginning your Mediterranean boat charter holidays in the opposite direction, namely the Antalya Celebi Marina, travelers can sail toward the Western Mediterranean, all the way to Gocek or Marmaris. Again both destinations offer major airports for overseas travelers. 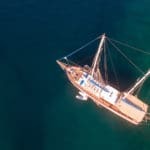 Going back to open seas gulet cruises, a uniquely designed itinerary can take travelers all the way to the island of Cyprus. Since most gulet blue cruises are one week long, this may either be a two week return trip or a one way, where disembarkation would be in Cyprus. However there will mostly likely be an additional cost (empty run / re-delivery fee) on a one way trip to Cyprus. How much this extra cost may be is dependent on the boat. Again, not all gulets are equipped for cruises in Turkey such as this. Therefore consulting with a professional yacht charter agent would be best, in order to find the right gulet boat charters for a trip such as this. For Mediterranean routes, the harbor choices to embark from are Marmaris, Gocek, Fethiye and Antalya. The most popular are Marmaris, Gocek and Fethiye as there are more variations in organizing itneraries in the Mediterranean coast of Turkey when leaving from these ports. 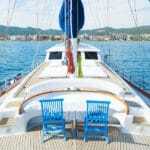 Boat charters in Turkey for this region are rated to cruise 4 hours per day. Any itineraries for a one week period which exceeds the cost of fuel (engine + generators), may cost more and priced per hour. The top blue cruise destinations in the Mediterranean of Turkey include all these places as well as the island of Rhodes. If you feel confused about where to travel, consult with your charter agent and discuss your plans. Based on the information you provide, your agent may be able to assist in planning with you, an ideal route to enjoy during your holidays.